Even casual inspection of a map of the Southern Hemisphere suggests that the coastlines of eastern South America and western Africa fit together like the pieces of a jigsaw puzzle. This same thought occurred to the naturalist-explorer Alexander von Humboldt who, during the early 1800s, found similarities between animal and plant fossils in South America and western Africa, and common elements between the mountain ranges in Argentina and South Africa. Subsequent explorers saw similarities between fossils in India and Australia. In 1912, the German geophysicist-meteorologist and polar explorer Alfred Wegener went a step further and proposed that the present continents were once fused into a single landmass, which he called Pangaea (“All-Lands”). 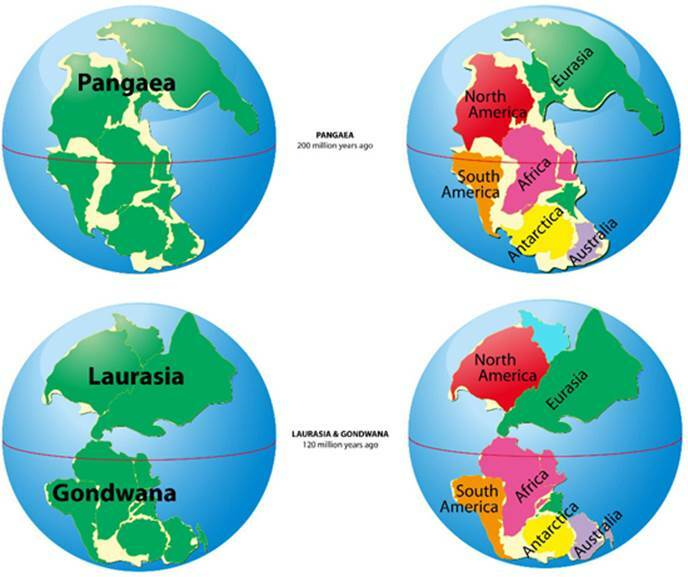 Expanding upon this theory in his 1915 book, The Origin of Continents and Oceans, Wegener described how Pangaea subsequently split into two supercontinents, Laurasia (corresponding to the present-day Northern Hemisphere) and Gondwanaland, also called Gondwana (Southern Hemisphere)—an event now thought to have occurred 180 to 200 million years ago. Wegener could not provide an explanation for continental drift, and his concept was roundly rejected until after his death in 1930 from heart failure during an expedition to Greenland. The occurrence of continental drift was finally accepted in the 1960s, when the concept of plate tectonics—involving plates that are in constant motion relative to each other, sliding under other plates and pulling apart—was established. Long before continental drift was acknowledged by the scientific community, naturalists were finding ancient fossils of the same or similar plants and animals in continents thousands of miles apart and separated by oceans. Fossil remains of the tropical fern Glossopteris were found in South America, Africa, India, and Australia, while those of the family Kannemeyrid, a mammal-like reptile, were uncovered in Africa, Asia, and South America. By contrast, some living plants and animals on different continents are very different from one another. For example, all the native mammals in Australia are marsupials and not placental mammals, which suggests that Australia split off from Gondwanaland before placental mammals evolved. SEE ALSO: Devonian Period (c. 417 Million BCE), Paleontology (1796), Darwin and the Voyages of the Beagle (1831), Fossil Record and Evolution (1836), Biogeography (1876). According to the theory of continental drift, a single giant landmass, Pangaea, split into the two supercontinents, Laurasia (Northern Hemisphere) and Gondwana (Southern Hemisphere).